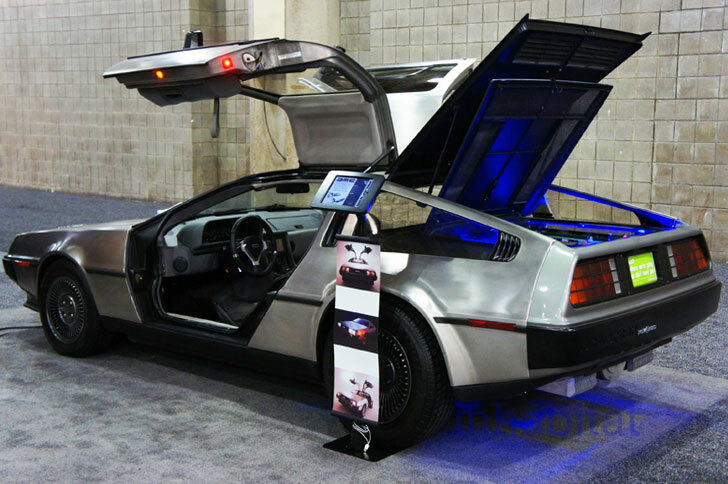 We got nothing but love when we first wrote about the electric DeLorean on Inhabitat, so we were floored when the back-to-the-futuristic car made a surprise visit to the NY Auto Show. 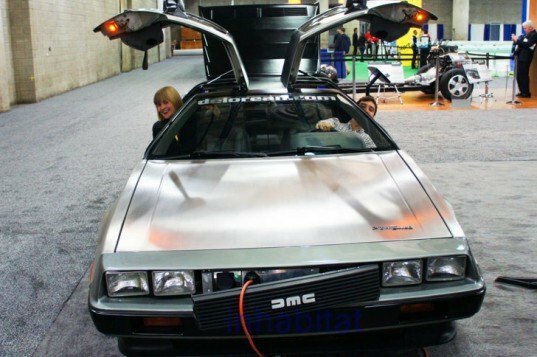 The DeLorean Motor Company (DMC) EV still has a ways to go before it is ready for production, but the company promises the concept car will definitely become a reality with a target release date of early 2013. As EV technology improves, the company hopes that DMCev vehicles will be re-powered with new batteries over and over again making them the ultimate in recycled products. The DMCev is powered by a 32-kWh lithium iron phosphate battery pack and has a 125 mile per hour top speed with a range of 100 miles. It can go from about 0 to 60mph in under six seconds. The vehicle can travel between 64 and 96 miles on a single charge, depending on driving habits and the environment. The current DMCev prototype uses a DC motor but the final model will use an AC for better range, performance and regenerative braking ability. As electric motors have only one moving part, they are much less prone to problems compared to more complicated combustion engines with many moving parts. The battery recharges on a typical 110v household outlet in about three to four hours. With a stronger outlet or a 220V charging station, it can be fully charged in under two hours. At $0.07 per kWh, that means it costs about $2.25 to fill the “electron” tank making it economically about eight times more efficient than a gas engine. The battery features “Safe Lithium” which is combined with oxygen in the manufacturing process so they do not explode if an accident occurs. Additional energy can be supplied from wind or solar power, making it even more eco-friendly and economic. The car will be assembled in Houston, Texas with assistance from Louisiana’s Epic EV startup company. The hope is that the car body will outlast many batteries and be re-used over and over saving on the huge amount of oil and other resources required to manufacture a new car. While energy savings from the EV will be well-worth it, though the $95,000 price tag may deter the average automotive consumer. As long as it can make 88 miles per hour. The battery recharges on a typical 110v household outlet in about three to four hours. With a stronger outlet or a 220V charging station, it can be fully charged in under two hours. At $0.07 per kWh, that means it costs about $2.25 to fill the "electron" tank making it economically about eight times more efficient than a gas engine. The battery features "Safe Lithium" which is combined with oxygen in the manufacturing process so they do not explode if an accident occurs. Additional energy can be supplied from wind or solar power, making it even more eco-friendly and economic. The car will be assembled in Houston, Texas with assistance from Louisiana's Epic EV startup company. The hope is that the car body will outlast many batteries and be re-used over and over saving on the huge amount of oil and other resources required to manufacture a new car. While energy savings from the EV will be well-worth it, though the $95,000 price tag may deter the average automotive consumer.